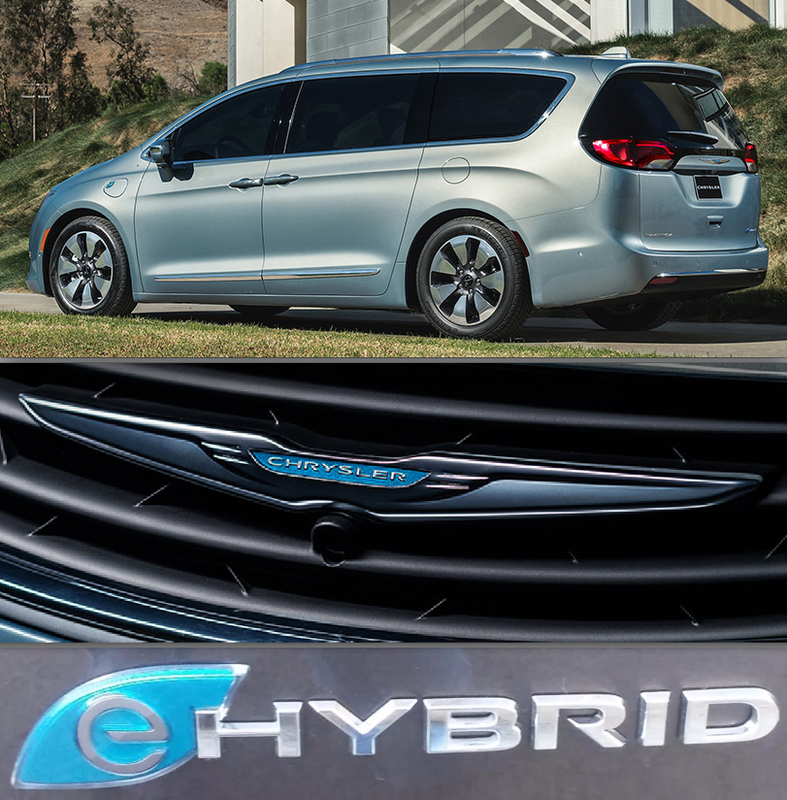 When it goes on sale early next year, Chrysler will break new ground by offering the first hybrid minivan to be sold in the U.S. In actuality, the new Pacifica Hybrid is a plug-in hybrid that offers about 30 miles of all-electric range before the gas engine kicks on, at which point it becomes a conventional hybrid – which is the case with all plug-in hybrids. However, Chrysler didn’t include “Plug-in” in the official name because it feels many customers equate that term with electric vehicles that have a limited driving range before they stop dead in the water, thus triggering range anxiety when it’s completely unjustified in this case. Elements that distinguish the Pacifica Hybrid from its gas counterpart are available Silver Teal paint (offered exclusively on the Hybrid), unique wheels, teal inserts in the Chrysler wings, and an “eHybrid” badge on the liftgate. So the drive cycle goes like this: If you have a fully charged battery and a full tank of fuel, you can drive the first 30 miles on electric power alone, after which the gas engine kicks in and gives you roughly another 500 miles. Then you can just fill the tank and go another 500 miles, and repeat until you get to your destination – just like in any other gas car. In fact, you never have to charge the battery if you don’t want to, as the vehicle is perfectly happy just functioning like a normal hybrid. But that isn’t using it to its full potential, as many folks will be able to do their daily commute on electric power alone if they plug it in every night. And what that means is spending about 4 cents per mile for electricity rather than about 12 cents per mile for gas. Speaking of recharging, the Pacifica Hybrid comes with a charging cable that plugs into a regular 120-volt household outlet. Using that method, Chrysler says it takes about 14 hours to fully recharge the battery. But if the owner has access to a Level 2 240-volt charger, that time is cut to just 2 hours. In most other ways, the Pacifica Hybrid mimics its gas-powered Pacifica sibling we’ve already covered in detail, so here I’ll focus on what’s different. First is the driving experience. The hybrid powertrain incorporates a similar 3.6-liter V6 engine as found in the regular Pacifica, but adds two electric motors and a CVT transmission to replace the normal 6-speed automatic transmission. 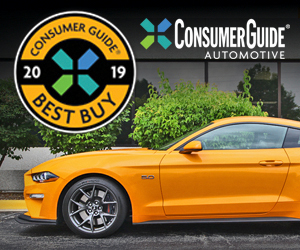 The engine has been modified for better fuel economy – which results in a lower horsepower rating – but the electric motors also add to the “total system horsepower,” which comes in at 260 vs. 287 for the gas version. And since the battery and its associated hardware add about 650 lbs to the overall weight, the Hybrid probably isn’t as quick as the gas version, though Chrysler refused to say by how much. The Hybrid’s instrument panel includes some gauges that help the driver get maximum benefit from the hybrid powertrain. In normal driving, the hybrid powertrain feels about the same as the gas one, whether you’re driving in all-electric mode or in hybrid mode. Unlike in many plug-in hybrids that have a smaller battery, we found the Pacifica Hybrid to be able to accelerate at a normal pace on just electricity without ever kicking in the gas engine, easily keeping up with traffic on electric power alone. If you exceed about half-throttle on take-off – whether in electric mode or hybrid mode – the gas engine has to kick it to help. When that happens, there’s a slight delay before power arrives, and then it comes in with a bit of a shudder and not particularly strongly at first, though it picks up soon after. If you’re driving at a steady speed and then dip into the throttle to accelerate, the vehicle responds fairly quickly and with adequate power. Official EPA fuel-economy ratings have not yet been released, but the Pacifica Hybrid is expected to earn an 80 MPGe rating (“MPGe” ratings are given to plug-in vehicles), and according to the trip computer in our preview test vehicle, we averaged 30.7 mpg over 100 miles of mixed city/highway driving, the first 30 being done on electric power. The regular gas-powered Pacifica is rated at 18 city/28 highway/22 combined, and we averaged 19.1 mpg in mostly city driving in a test vehicle. So you forfeit a little in drivability to save money on gas. The Hybrid forfeits the Stow-N-Go fold-away 2nd-row seats available on the gas version, replacing them with buckets that slide fore-and-aft to help balance 2nd- and 3rd-row legroom. When slid fully forward, there’s a decently sized passageway to the 3rd row. Something else that’s given up is the Stow-N-Go option. Chrysler minivans have become famous of late for being the only ones to have 2nd-row seats that fold flat into the floor; in all other minivans, the 3rd row folds into the floor, but the 2nd row seats have to be removed to open up full cargo capacity. Stow-N-Go 2nd-row seats fold into bins under the floor, and in the Hybrid, those bins are filled with the hybrid battery. 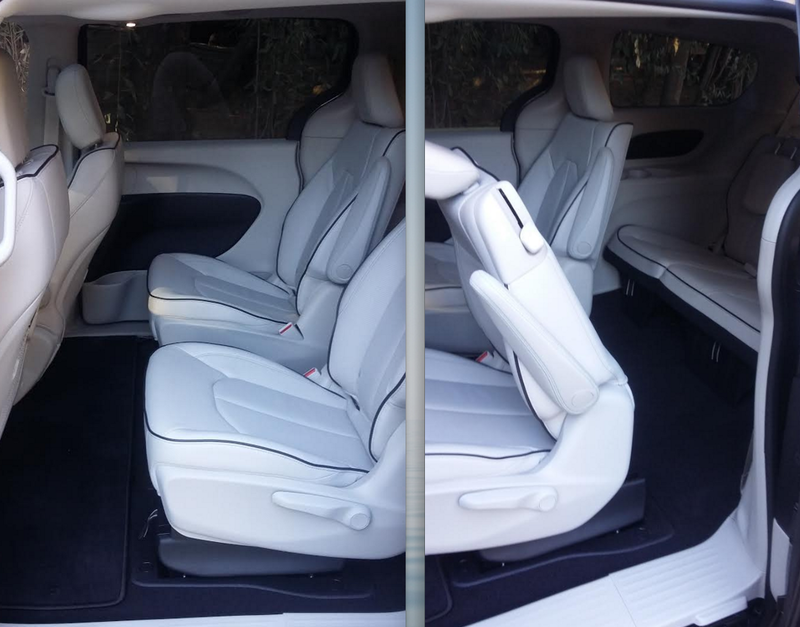 So in order to open up full cargo capacity, the 2nd-row seats have to be removed as in other minivans. (When they are, you can fold the 3rd-row seats and completely enclose 4×8 plywood sheets laid flat on the floor.) The 2nd-row seats slide fore-and-aft to balance legroom in the 2nd and 3rd rows – which those with Stow-N-Go do not – but they don’t tilt forward as do those with Stow-N-Go, so the passageway to the 3rd row is a bit more restricted. It’s still reasonably easy to get back there, though, and Pacifica Hybrid can easily seat seven adults in comfort. But there’s one other notable difference, which we feel is a pretty big deal — unless you live in “climate controlled” coastal California. One advantage to most every plug-in vehicle is the ability to pre-heat or pre-cool the interior before you get in. With most, however, this can only be done if it’s plugged into an outlet. But Chrysler says it can be done with the Pacifica Hybrid even if it’s not, which means you can do it while it’s sitting in your parking lot at work. Although all the hybrid components add quite a bit to the cost, the Pacifica Hybrid’s 16 Kilowatt-hour (kWh) battery makes it eligible for a $7500 federal tax credit. (The amount of the credit is based on battery capacity, and 16kWh is the minimum for getting the maximum $7500 credit.) As equipment levels vary between the gas and Hybrid models, it’s difficult to make an apples-to-apples comparison on cost. But for most buyers, the Hybrid isn’t going to set them back much more than a fairly comparable gas version. There are only two trim levels of the Hybrid: Premium and Platinum. 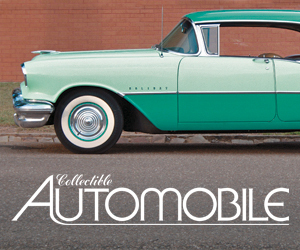 The Premium starts at $43,090 including destination, or $35,590 after the $7500 tax credit. The only option is an $895 DVD entertainment system. Platinum starts at $47,885, or $40,385 after the $7500 tax credit, with the only option being a $1795 panoramic sunroof. Kids today seem to be quite aware of all things “green.” And there are few better ways to support that interest than by transporting up to six of them in a hybrid vehicle — with the bonus that it saves you money in the process. The Pacifica is a significantly more stylish conveyance than its Town & Country predecessor. In Hybrid form, it’s also far stingier with fuel. Written by: Rick Cotta on November 22, 2016.